Dot Kesterton is no stranger to BUZZ, with plenty of experience, teaching runners half her age how it’s done! 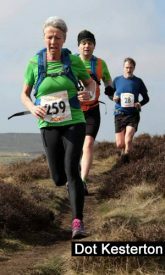 Running for #TeamAccelerate, as well as Sheffield’s Steel City Striders & her local ladies club ‘Smiley Paces’ – she competes within the V60 category (outdoing many in the V50 & V40) and runs like she means it. 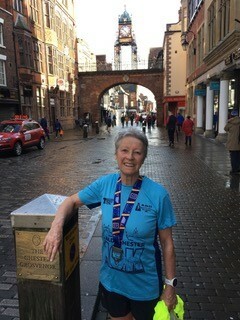 Chester 10K road race and England Athletics Masters Association, (EAMA) qualifying race Sunday 10th March 2019. Chester 10K is described as a fast out and back course, North West from the Northgate Leisure Centre to the village of Millington and back to the town centre. I was concerned at the weather forecast for the UK which showed rain, sleet snow and blustery winds across the country so was pleased to wake to drizzle and a breeze and temperatures around 5’, unlike Sheffield which woke to snow. After a good warm up I stripped to vest and shorts and shivered at the start line waiting for the off. The start, much like Percy Pud is ranked in five minute intervals. I wandered towards the front, ‘elite’, and discovered few athletes filling the space so decided to fill it for them. It’s a bit unnerving hanging about with young men and women who were going to leave me in the dust at the sound of the claxon but no one seemed unduly bothered so I skipped about and admired my goosepimples. The first mile was all about trying to find a pace I knew I could sustain for 45 minutes or so. I erred on the conservative side, around 7.5 minute mile pacing and used the time to pin my eyes on the man with Chester Triathlon on his shirt running at around my pace so I could try and hang on to him. The turn, at Millington was a big boost because I was running at my normal parkrun pace, around 22:30 at the 5K mark and feeling OK.
At around 8K the course begins the ascent into the town, again reminiscent of Percy Pud. In fact I think I said aloud, “just passed the dam wall now, dig in,” which would only mean anything to a Sheffield runner. I thought my finish would be a bit ragged but the crowds were yelling and helping keep up my spirits and before long I could see the welcome ‘Finish’ gantry. I managed to push through the pain to the end and was delighted to see the time: 45:26, gun. That would be enough to earn me an age group pb, a Striders club record and most importantly a place in the EAMA 10K race in Birmingham in May. The Chester triathlete was just ahead so that tactic worked well. 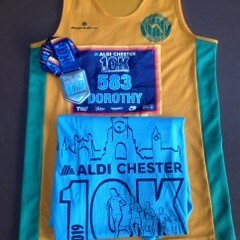 I recommend the Aldi Chester 10K road race as a fast and well organised race in a lovely town even if it is the other side of the Pennines. 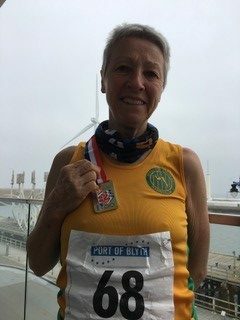 Port of Blyth 10K incorporating the British Masters 10K Road Championships, 7th April 2019. The race is billed as fast and flat, on footpath and cycleway from the quayside to Seaton Sluice and back. I decided to go to Northumberland not to miss the delights of the Dronfield 10K or even the Manchester marathon, but to defend my 2018 F65 10K title won last year at Trentham, Stoke. It was cool and still on the quayside at the start of the race. I looked round for any familiar Sheffield shirts, but guessed you all had something more important to do last Sunday, so I did my customary jigging about for a warm up and pressed myself to the front of the pack for a swift getaway. Running south from the quayside along paths and a cycle track I concentrated on my pace and form. My plan was to go for a consistent 7.30 minute mile pace and try not to fade in the last half mile or so. in the event I ran a little too fast, (first mile in 6.58), completing 5K in 22 minutes and had to draw on all my reserves to hold on for the remaining 5K. The F70 World Champion, Angela Copson overtook me in the home straight giving me the push I needed to sprint for the line. Thanks to Angela’s appearance I managed to shave a whole second off my chip time from last month’s 10K at Chester to win the F65 title and gold medal in 45:13 gun, 45:09 chip. I’m thrilled to remain at the top of the Run Britain Rankings F65 10K ladder and 13th in the F65 All Time 10K records, at least until the next race which is in Birmingham next month. The Men’s race was won by Noah Hurton, Milton Keynes in 31:18 and Alyson Dixon, Sunderland Strollers in 33:28. One of the more notable Masters results was Alex Sutherland, M70, Inverness Harriers in 40:49. I congratulated him afterwards on such a brilliant run. He spoke of the importance of positive mental preparation and focus on core training. I found him to be a real inspiration and role model for older athletes. The next BMAF road championship is the 5K on June 16th at Horwich, Bolton. Check out the website if you’re over 35 years old and fancy having a go. Dot Kesterton, Steel City Striders RC, Smiley Paces RC and NMAC. Special Gests who love to run and have something to say. Running, kit and gear, racing and adventures... anything goes, thank goodness!